Cincinnati mdl. 1410 3/16” x 10’ Hydraulic Shear s/n 35034 w/ Controlled Back Gaging, 150” Squaring Arm. Engel mdl. 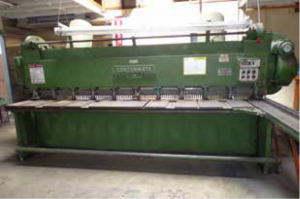 1010BA 10’ Press Brake s/n 1901-A-70 w/ Press Brake Dies. Rotex mdl. 18-ACH-62 18-Station Hydraulic Rotary Punch s/n 13486 w/ 1/8” to 2” Cap. Boschert type LB12PN4H 9” x 9” Power Notcher s/n 4 w/ Fence System. 48” Power Roll w/ 3” Rolls, Rolling Stand. Trace-A-Punch Nibbling Punch w/ 15 ½” Throat. Lockformer 5-Station Hydraulic Notcher s/n 703 w/ 16GA x 120” Cap. Chicago mdl. BPO-412-6 48” Finger Brake s/n 305354. Pexto 36” Hand Roll w/ 2” Rolls. Pexto mdl. 055-D 22GA x 36” Cleat Bender s/n 5/64. Lockformer No.24 24” Cheek Bender s/n 85. Lockformer Cleatformer 22GA Roll Former s/n TR2432. Tennsmith 6” x 6” Hand Notcher. J.F. Kidder 6” x 6” Hand Notcher. Pexto 12” Hand Roll w/ 1” Rolls. Pexto mdl. 622-E Roll Crimper s/n 8/64. Lockformer “Easy Edger” Hand Beader s/n 69. Whitney-Jensen mdl. 118 Hole Punch s/n 2341-3-70. Brobo “Super 325” 10” Miter Cold Saw w/ Side Supports. Lockformer mdl. 24S 24”Vertical Band Saw s/n 5183. Delta Tilting-Arbor Table Saw s/n 93D96422 w/ 48”” Table Extension, Delta Fence System, Rolling Stand. Rigid 16” Abrasive Cutoff Saw. Acra 12-Speed Pedestal Drill Press. Husky Vertical Air Compressor w/ 80 Gallon Tank. Miller Syncrowave 250DX CC-AC/DC Squarewave Power Source s/n LC679745 w/ TIGRunner Cooling System, Cart. Miller Dialarc HF CC-AC/DC Arc Welding Power Source s/n JF940044 w/ Coolmate-3 Cooler. Lincoln SP-100 110 Volt Arc Welding Power Source and Wire Feeder s/n AC792608. Lincoln 225 Amp AC/DC Arc Welder. Thermal Dynamics ThermalArc PAK 5XR Plasma Cutting System s/n R60927A18321A. Acme type 2-18-30 30kVA x 18” Spot Welder s/n 8539. (4) 48” x 96” Rolling Welding Tables. Greenlee Hydraulic Knockout Punch Set. Bosch and Milwaukee Jig Saws. 2006 Chevrolet 3500 Stake Bed Truck Lisc# 8C02503 w/ Vortec V8 Gas Engine, Automatic Trans, AC, 53,531 Miles, 647 Engine Hours, VIN# 1GBJC34U36E1620988. Caterpillar C50005000 Lb Cap LPG Forklift s/n AT9002963 w/ 3-Stage Mast, Side Shift, Cushion Tires, 8647 Metered Hours.